Judging by the influx of entries already received by the organisers, a record entry is expected for the final three races of the HRDC's inaugural season, which are to be held at Snetterton over 1-2 October. The HRDC has enjoyed an extraordinary maiden season, with full entries for all its races to date, building on the club's ethos of "placing the competitor first", which has contributed in no small part to some memorable racing and an unrivalled spirit of competitor camaraderie in the HRDC race paddock. 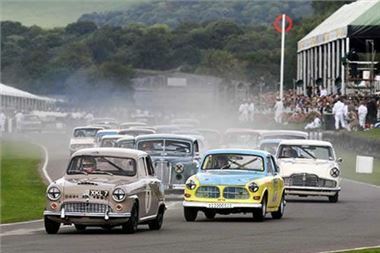 THE HRDC RACES: HRDC 'TOURING GREATS' for pre-'60 historic touring cars. Where else will you see cheeky Austin A35s nipping up the inside of mighty Mk1 and Mk7 Jaguars; or gripping battles between an apparently unlikely mix of Standard Vanguards, Rover 105s and Humber Super Snipes? The series is so popular that current BTCC star Paul O'Neill took to the wheel of a Morris Minor 1000 at the HRDC's recent round at Thruxton, declaring afterwards that he was extremely impressed by the speed of the cars and the overall high standard of driving from the HRDC drivers. HRDC 'GRAND TOURING GREATS' for sub-1500cc pre-'66 historic GTs. 'Pocket Rocket GTs' is the nickname often applied to this competitive series. All cars in this series run engines under 1500cc, yet the race pace of these historic GTs is phenomenal. Like the pre-'60 touring cars, the HRDC 'Grand Touring Greats' Series has a great mix of marques and models: Sebring and Speedwell Sprites, one of the original Le Mans Healey prototypes, MG Midget-based Lenhams, Ashleys and WSMs, plus Tornado Talisman, GSM Delta, Rochdale Olympic, Lotus Elite - they are all here. HRDC 'TC63' for pre-'64 Gp2 historic touring cars. The HRDC is launching its new series for pre-'64 Gp2 historic touring cars at Snetterton on 1 October. Based around the first UK round of the ETCC in 1963; no 'homologation specials' - so often the dominating force in later pre-'66 races - are permitted entry to this series. So expect to see the welcome return of the Jaguar Mk2 to the sharp end of the grid. Vauxhall VX4/90s, Volvo Amazons, 850 Minis and 997 Coopers, Ford Zodiac Mk3, Abarth 850 and 1000TC, late-model Sunbeam Rapiers and a sprinkling of early 997 and 1200 Anglias will offer close racing with an all-important affordable entry level.